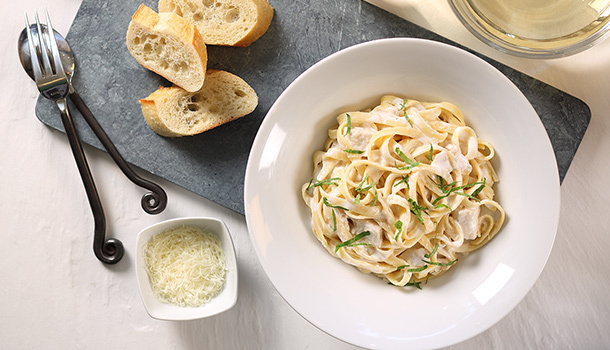 Delicious, creamy chicken fettuccine alfredo made with Odyssey Greek Yogurt will liven up your dinner table. This dish is certain to be a big hit with your family or when entertaining friends. Delicious, creamy chicken fettuccine alfredo made with Odyssey Greek Yogurt will liven up your dinner table. Cook fettuccine according to package directions; drain (do not rinse) and place back in pot. While fettuccine is cooking, add grape seed oil to a large skillet and place over medium-high heat. Add chicken breast pieces, cook and stir until done. Cover and set aside. In a large saucepan, add Greek Plain Yogurt, cream, milk, butter, nutmeg, salt, pepper, garlic powder and cheese. Whisk to combine and place over medium-low heat. Cook and gently stir until cheese melts and sauce is done, about 5-8 minutes. Add cooked chicken pieces to pot of drained fettuccine then pour sauce over pasta; stir and heat through. Turn heat off, cover and let stand until fettuccine has absorbed most of the sauce; stir and serve. Garnish with a fresh basil leaf.